Meet our new executive director...Jodina Hicks! Jodina Hicks arrived in Camden as an 18 year-old. A freshman at Eastern University who wanted to “make a difference”, she found her way to Camden one Sunday morning. That was 1988. Her first assignment twenty-three years ago was to teach a Sunday School class for 13 middle school girls. By far the rowdiest group of children in our young ministry, Jodina walked into class with no curriculum, no experience, and no training. The girls did their best to scare off their new, young teacher from a steel-town in Pennsylvania. But Sunday after Sunday Jodina kept coming back, slowly gaining the trust and respect of the girls. After a few months I realized there was something special about this young woman. Her persistence, her love for Camden, and her passion for young people was palpable. Over the next 12 years, Jodina helped me build the ministry of UrbanPromise. She created the StreetLeader Program—our dynamic teen employment and leadership initiative. She worked with me to open the UrbanPromise Academy in 1997—our high school which has become a last chance educational opportunity for our most vulnerable teens. Hundreds of teens were impacted by her life. In 2000, Jodina left UrbanPromise to attain her law degree from Rutgers University and move into the non-profit world of prison reform and prisoner reentry—a critical mission that helps formerly incarcerated men and women successfully transition back into civilian life. After a few years with Public/Private Ventures in Philadelphia, she went to Chicago to become Vice President of the SAFER Foundation. SAFER is the premiere prisoner reentry program in the country. On July 6th, 2010 Jodina returned to UrbanPromise to assume the mantel of Executive Director. With over 60 full-time staff, a $3.2 million dollar budget, and hundreds of youth involved daily in an array of programs, I needed a competent administrative leader to manage and grow UrbanPromise in Camden. In twenty-three years of managing a non-profit, teaching organizational leadership, and consulting with other non-profit organizations, I have yet to meet a person who embodies administrative leadership like Jodina. Jodina has a rare skill-set of high level administrative ability, visionary leadership, inter-personal skills, and passion for youth. UrbanPromise has been given a remarkable gift in Jodina. Our ministry is in incredibly capable hands. UrbanPromise is poised for a dynamic new chapter under Jodina’s leadership. I’m not going anywhere. I continue to serve as the president of UrbanPromise Camden—speaking, promoting, recruiting interns, raising resources, and working with UrbanPromise International to expand the reach of UrbanPromise globally to other North American cities, Malawi, and Honduras. Thanks for your continued support over the years. Great things are happening. today. The children of UrbanPromiseʼs elementary and middle school (The CamdenForward School) celebrated the release of Monarch Butterflies that they have nurtured from eggs through the caterpillar and chrysalis stages to regal Monarchs that are now ready to join in a 2000 mile mass migration to Mexico. The eggs were collected from milkweed plants grown in a Butterfly Garden that students and volunteers keep and maintain on the UrbanPromise campus. The Monarch Butterfly project has been a truly holistic learning experience, involving nature, science, writing, and art, including a mural created on the wall of an UrbanPromise building facing the butterfly garden. 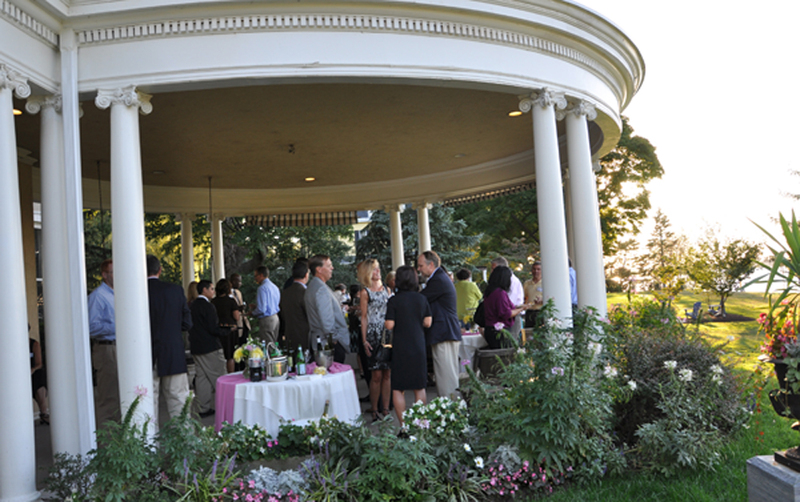 Senator Diane Allen and Samuel Allen hosted the UrbanPromise Banquet table host kick off reception at their beautiful home on the Delaware River in Edgewater Park, NJ tonight. We are so thankful for over 40 table hosts so far with 1 month to go. Time magazine recently published an article entitled, The Case Against Summer Vacation. Arguing that summer vacations are an outdated legacy of the farm economy (farmers needing children to harvest fields), the writer illustrates how the academic impact on poor, inner-city children is devastating. By 5th grade the cumulative impact on children who spend their summers idly watching TV or roaming the streets is a two year academic deficiency compared to their upper middle class counterparts. The “summer slide” can be irreversible, putting low-income children in a position where it is almost impossible to catch up. There is hope! According to studies, summer programs that focus on academics, life-enriching experiences and FUN can move children from the 30th percentiles to the 70th percentiles in math and reading. Summers can be redeemed and turned in life-transforming experiences for children. UrbanPromise just finished another season of offering 7 week summer programs for Camden’s children. Since the beginning of July, our children and teens experienced educational, spiritual and social experiences fostering growth and development—while keeping these precious young people off dangerous streets. Thank you for your support in addressing this critical issue. I promise—you are changing lives! Click here to read Time Magazine article "The Case Against Summer Vacation"
Many of you may remember the young, charming Ivan Stevens from the Diane Sawyer 20/20 Special, Waiting on the World to Change, which aired in January 2007. Ivan was a 4 year old homeless boy who wanted nothing more than anything to be Superman and find his family a place to live. Camden, there was an outpouring of support from people across the United States. UrbanPromise received letters and donations to help that 4 year old boy, his mother and his 3 year old brother, Imere. Because of your generosity, we were able to help find Ivan’s family an apartment, enroll him in our CamdenForward School and obtain a job for his mother. The experience of being a conduit for your generosity and compassion was an extraordinary moment for me and our team at UrbanPromise. Looking back, I remember that Ivan really struggled to catch up with his school work. Understanding abstract concepts and simple math required extra time and effort on his and his teacher’s part. Our principal worried about him but Ivan persevered and did not give up. I looked down at the boy’s color-coordinated bar graph. It towered well above the national average. 64th percentile for reading comprehension! 80th percentile for math. Wow! What made those numbers so impressive? Nationally, the average score in poor, urban communities is typically between the 20th and 30th percentile. And also Ivan had gained about 15 percentage points each year he has been in our school. Despite his early setbacks Ivan caught up and passed his peers. I think you’ll agree: that’s news to cheer about! Last week Ivan began his third grade year at our CamdenForward School. And what’s more, Ivan has been teaching his brother, Imere, how to be a good first grader at our school. 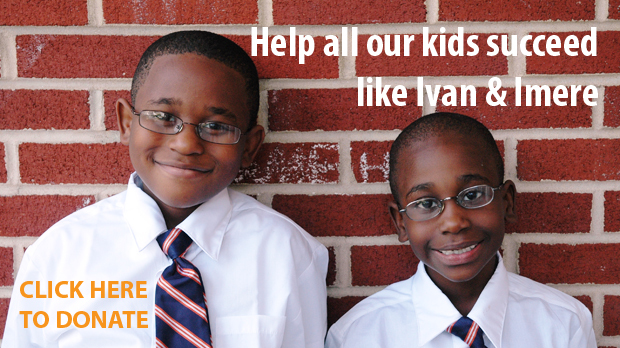 But, as always, I need your help to keep Ivan and the other 140 boys and girls at our school moving forward. The students need textbooks and other educational supplies which will give them all the opportunity to succeed. Please consider making a donation this September for a child, the Ivans and Imeres, at the CamdenForward School. PS: I’ll keep you posted about Ivan’s and Imere’s progress this fall. I know you’ll be interested to watch these two impressive young men grow and mature even more. And they and I will be ever grateful.